When the official Japanese Website was updated a short awhile ago, a new video was also uploaded displaying some game footage of the Master Quest. While the audio of the person talking is entirely in Japanese, you can pretty much piece together what he is saying. After the introduction explaining what the Master Quest is, the video does a side-by-side comparison of the original quest and the Master Quest. You can see the mirrored version of the game, but just as important the added difficulty. In particular, there are multiple rooms from the Great Deku Tree shown. In the original quest, there is a single Mad Deku Scrub in the center of the room, while its Master Quest counterpart has several enemies surrounding the room as well as a massive deku baba in the center. In another room the original quest shows a platform where you must jump to and then make another jump to get to a treasure chest. The Master Quest has this same platform but its further away, forcing you to make a perfect jump. Additionally, there is a big skulltula, smaller skullwalltulas, and other small enemies crawling around the room. Clearly they are emphasizing that the Master Quest has significantly more enemies and harder enemy combinations in rooms. The next scene shows Link taking damage and it is hear that I presume the commentator is talking about the new double damage feature. Basically, all of the enemy attacks in the Master Quest will now do double the amount of damage that they did in the original quest. This includes all of the bosses during the Master Quest and during the Boss Challenge. For more information on the Master Quest, check out the Uber Master Quest post I made at the site a few days back. Personally, I’m very excited about the Master Quest. I didn’t play it much on the GameCube so it’s not 100% fresh in my mind when I think back to it. Additionally, the fact that it is mirrored will make it seem completely different from the little that I do remember. More enemies, harder enemy combinations, new puzzles, and double the amount of enemy damage is certainly going to make this quite a challenge. I’m greatly looking forward to getting my hands on the Master Quest when Ocarina of Time 3D ships here in the US on June 19th. Have you beaten the Master Quest before? Are you excited about the challenge of the Master Quest? 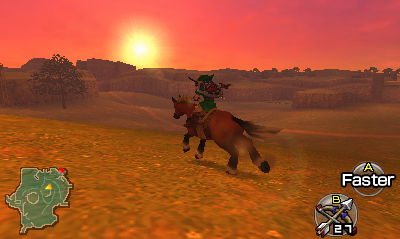 Will you be picking up Ocarina of Time 3D on day one? Let us know by posting in the comments below.